Satya, who's behind some beautiful GTK and GNOME Shell themes, has created a cool new tool that lets you customize GTK theme colors. Even though this is a brand new tool, it seems that GTK Theme Preferences might be included by default in the upcoming Xubuntu 13.04. A similar feature was available in GNOME 2 by default, but unfortunately it wasn't included in GNOME 3 and since then, GNOME (this includes Unity) users who like to customize the GTK theme colors had to do it manually, by changing configuration files. Well, that's not the case anymore thanks to GTK Theme Preferences. The application comes with a limited set of features for now as you can see (which are still very useful), but hopefully it will gain even more customization options in the future. Here's an example: in the screenshot above you can see Greybird GTK theme which by default uses blue for the selected background color and comes with a light panel and light menus. 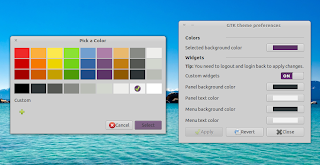 Using GTK Theme Preferences, I've tweaked it to use a dark panel, a purple selected background color and dark menus. Arch Linux users can install GTK Theme Preferences via AUR. Once installed, launch GTK Theme Preferences from Dash / the menu, make any changes you want, make sure the "Custom widgets" toggle switch is turned on (or else the changes won't be used by your GTK theme!) and click Apply. Then, you'll have to log out and log back in to see the changes. Unity users can also run "setsid unity" in a terminal instead of logging out. If you want to download the source, you want to report a bug or want to help implement translations support, visit GTK Theme Preferences on GitHub.